My introduction to the ponderosa pine, the “tree of many names,” some 30 years ago, was a bit confusing because of the tree’s numerous nicknames: “long-leafed pine,” “bull pine,” “blackjack,” “yellowbelly,” “red pine,” “silver pine,” “Montana black pine,” “pondo,” “pino real” (true pine) and “pumpkin,” all of which rolled off the tongues of forestry professors and park rangers. I thought at first that the labels must apply to the various trees in a mixed coniferous forest, not realizing they all referred to a single species, the ponderosa pine. In his book A Natural History of Western Trees, Donald Culross Peattie writes, “If you know your West at all, you know its Yellow [Ponderosa] Pine.” With its three needles joined in a bundle, they form a Y to help identify the species. 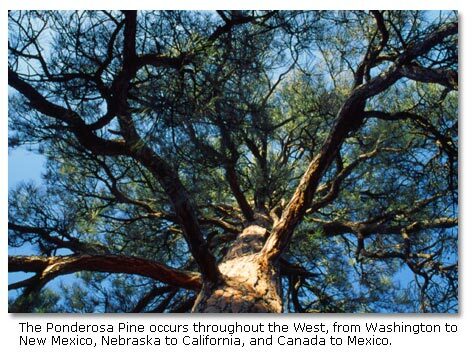 The ponderosa pine occurs throughout the West, from Washington to New Mexico, Nebraska to California, and Canada to Mexico. It is the state tree of Montana. It grows in locations with an average of less than 20 inches of annual precipitation typically, in the Southwest on mesas and mountain ranges from 6,000 to 10,000 feet in elevation. While searching for the Northwest Passage with the Corps of Discovery, Lewis wrote, “The long-leafed pine forms the principle timber of the neighborhoud [sic]” During their journey, Lewis and Clark collected and described plants new to science. Lewis' reference to the ponderosa pine outlived his collected specimens, which succumbed to the rigors of early 19th century Western travel. Almost 25 years later, a Scottish botanist named David Douglas would rediscover the ponderosa near present day Spokane, Washington, and give the tree a new scientific namePinus Ponderosa or ponderosa pine. “Ponderosa” is the Latin word for “heavy, weighty, or significant” and refers to the impressive size and stature of the trees. 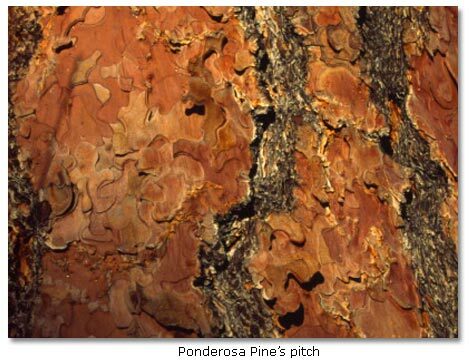 The natives knew of the fire-resistant nature of the ponderosa pine’s thick bark. They lived among trees bearing the scars of the fires that swept through the ponderosas’ understory in frequent cycles. The fires were generally not catastrophic. They were of a low intensity, which reduced fuel loads and lowered the level of fire danger to the larger trees. At times, the flames from the cool-burning surface fires would eddy out around the base of a tree, burning off small sections of bark and killing the cambium layer below. Repeated fires would scar the exposed wood, and the bark along the scar’s edges would form into a pattern resembling a Gothic arch. Known as “cat faces,” these scars have been analyzed to develop a history of pre-settlement fire cycles. The bark on even a young ponderosa is somewhat fire-resistant, though it is very different in appearance than that of a mature tree. Young trees wear a thin dark gray to blackish flaky bark. Foresters and loggers call these younger trees “blackjacks” after their dark coloration (black) and lack of reproductive abilities (jacks). Pondos do not become cone-bearers until they reach about 45 to 60 years of age, about the time when the bark becomes more furrowed and thicker and starts to take on a reddish hue. At this time the tree produces both male and female cones, and every three to five years it produces a dense crop of cones. The smaller, male cones release miniature pollen grains, barely one-tenth of a millimeter long, that sport two balloon-like bladders, which enable winds to carry the grains from tree to tree like golden dust. 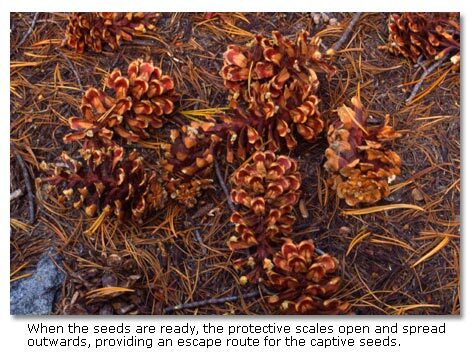 Once fertilized, the female cone’s seeds take more than 18 months to mature. Sharp prickles at the tips of each cone scale protect the developing seeds from marauding squirrels and birds. When the seeds are ready, the protective scales open and spread outwards, providing an escape route for the captive seeds. Riding on single papery wing, seeds may be carried aloft hundreds of feet, swirling about at the mercy of the wind. The opened cones invite tassle-eared squirrels, red crossbills, evening grosbeaks and Stellar’s jays to feast on the mature seeds. Yet even as each tree produces several hundred cones, each with an average of 75 viable seeds, they issue an invitation to feed that is not without obligation. With winter coming on, the wild creatures collect and bury seeds in caches for later consumption. Some of these larders go untouched and the seeds sprout, helping yield successive generations of trees. From the numerous seeds produced, only a small percentage ever sprout and grow. Sprouting conditions change and many seedlings die from lack of soil moisture. A sprout that survives for a year may have a two-foot taproot in comparison to a three-inch height aboveground. Further thinned by competition for resources, herbivores and wildland fires, the surviving trees must fend off insects and diseases as the trees mature and change. Approaching 125 to 150 years old, the furrowed ponderosa pine bark again transforms, taking on the flaky reddish-orange to yellowish colored bark of old-growth trees. Composed of numerous thin layers that resemble jigsaw-puzzle pieces, this colored bark gives the trees their nicknames “yellowbellies” or “pumpkins.” Resembling an impressionist painting, the bark pieces are a subtle mosaic of yellow and brown hues. Though the bark was not used in native paints, many tribes did harvest the sweet, inner bark as a food source in the spring. Timing was critical and periodic sampling would reveal when the sugar content was right for harvesting. When ready, sections of the outer bark were cut and removed with a scraper (possibly a flattened bighorn sheep’s horn). The women were careful to not girdle and kill the tree for this would deprive them of future food resources. The sweet cambium layer would then be cut into sections and rolled for later consumption. The natives also harvested the tree’s pitch to waterproof baskets or repair canoe leaks. Western settlers also relied upon the ponderosa pine’s pitch or oleoresin. The resin contains volatile oils called terpenes, which give the bark a vanilla or butterscotch aroma. The resin was used around the Civil War era to produce turpentine. Trees were scarred and the sap collected for these compounds. Though the timber industry is but a shadow of its former self, ponderosa pines still rank second in softwood lumber production in the United States. Both the young, fast-growing ponderosas  known as bull pines  and the mature, slow-growing trees are harvested. Known for their knotty wood, the bull pines are made into paneling, and the mature trees are logged for the clear-grained wood. 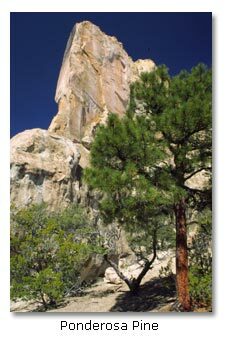 The champion ponderosa pine grows in the Plumas National Forest of California. At 223 feet tall, this massive tree towers over the surrounding forest. In Colorado, there was an ancient ponderosa pine that dated 1047 years old. Perhaps “long-lived pine” could be another nickname for this species.